June is just beginning, but the summer heat has already shown up in the Inland Empire. A splash pad – a recreation area with no or little standing water – is a great place to cool off in the summer heat without all the stress of going to the neighborhood pool. A splash pad is something all of the children can enjoy – from bigger kids to toddling babies. One-year-olds love to splash in a small pool of water. Older kids love watching other kids manipulate streams of water and sticking their feet in the fountains in the ground. Wear sunscreen and bring an umbrella if there is not going to be shade nearby. Wear a swimsuit to play in the water and consider water shoes. Avoid flip flops that get slippery when wet or catch on rubberized ground. Don’t bring the family dog to a splash pad. Not only could a child with a fear of dogs be forced to leave the pad, but even a well-trained dog could get nervous or overexcited around screaming, running kids. Since there is no need for a lifeguard at a splash pad, keep a close eye on your children. Wear swimsuits to a splash pad if possible, including swim diapers if needed. There are many splash pads all over Inland Empire (Riverside and San Bernardino counties) – from public spaces, regional parks to water parks. Here’s a list of some you don’t need to pay admission to get you started. 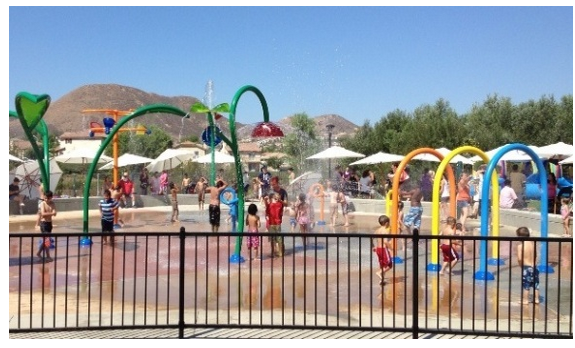 Citrus Park Splash Pad at Citrus Parkin Corona is open from 10 a.m. to 7 p.m. until September 30th. The splash pad, which features water cannons, leaf-like structures and other ways to play, is near two playgrounds and grass areas for drying off in the sun. Victoria Gardens in Rancho Cucamonga has a small fountain feature splash pad in the center of the shopping area, close to Bath & Body Works and Ben and Jerry’s. There is a family-friendly bathroom nearby for changing. Monte Vista Park in Chino features a fenced-in splash pad with a tall geyser spray and has benches nearby. The seven-acre park, which also features playgrounds and basketball courts, will have the splash pad running 7 days a week Open June 14 – September 1 from 10am-6pm. The colorfully-lit interactive fountain at The Shoppes at Chino Hills is in the middle of the shopping center. There is a bathroom for changing nearby, so change out of your swimsuit and get dry before you go shopping or have lunch. Veterans Park in Colton has along with the splash pad has large trees and grass nearby for moms to stay in the shade. There is two playgrounds, other activities and a library and community center. The splash pad at Tom Minor Park in San Bernardino is right next to a covered area with picnic benches and a playground. However, there are no bathrooms at the park – the nearby Arco station bathroom (by Starbucks) is the closest option. 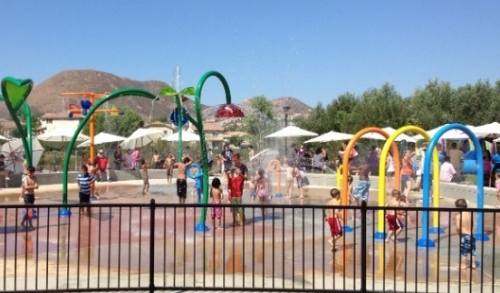 Lake Elsinore’s Canyon Hills Community Park has a splash pad along with its 18 acres of park activities and sport fields. The whimsical splash pad is walled off and surrounded by umbrellas to keep parents cool. There are several Inland Empire waterparks and regional park options for cooling off this summer. Rent a cabana or bring a beach blanket and go for a wet n’ wild time! Summer heat is upon us and, while splashing in a pool or running through a sprinkler can be fun, it’s nice to take a day and really immerse yourself in the joy of cooling off. There are water parks across the Inland Empire that are private or government owned, allowing for every way you can imagine to cool off, from sliding down a water slide, catching a wave in a wave pool or being splashed with 100 gallons of water at a play area. Castle Park’s Buccaneer Cove has a five-level structure of wet fun, including several slides, spray fountains and a splash bucket. There are several ticket options available, from just Buccaneer Cove entry at $13 to also including mini golf and the theme park rides at Castle Park in Riverside. Season passes are available, pay to park. 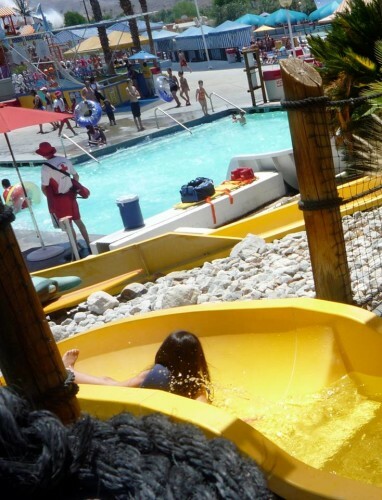 The Cove Waterpark has a surf area, never-ending river, slides and an aquatic play structure. Cabanas and swim lessons available, as well as week-long day camps including swim lessons. Waterpark is open 7 days a week through mid-August, then weekends through mid-September. General admission is $18, 36-47” tall is $14, and $9 for guests 30-35” tall. The Cove Waterpark is at 4310 El Camino Real in Riverside. Dropzone Waterpark is home to slides, a continuous river, multistory water activity area, and a splash pad with ‘geysers’ for little children. Swim classes available. Park is open most days through August and weekends in September. Admission is $18 for general admission, junior admission for kids 36-41” tall is $14, and tots 30-35” tall is $9. Annual passes available for $53 and $47. Dropzone Waterpark is at 2165 Trumble Road in Perris. Mulligans in Murietta has a splash zone and water slides, making it very family friendly as kids can play around in the zero-depth area. Tickets for the water park are $15, or add on rides, mini golf and more for $24. Pyrite Rapids Waterpark at Fiesta Village in Colton has a double tube slide, a body slide and one that sends you off with a gush of water. Passes are available just for the water park- under 48” is $11, over 48” is $15. Or stay and play miniature golf, ride amusement park rides or go roller skating. Splash Kingdom Waterpark in Redlands offers several slides, a lazy river, kiddie pool and wave pool. . Other park options include trampoline area, arcade, sports bar and more. Splash Kingdom, formerly known as Pharoah’s Lost Kingdom, has offers including water park admission, lunch and trampoline time, as well as a discount for entry after 4 p.m. General admission is $30, with 3-12 year olds $17. Season tickets are available to the waterpark, pay to park. Wet N’ Wild Palm Springs, formerly Knott’s Soak City, has reopened under a new name this year wit the same variety of rides geared for a little adventure, or for some wet family fun with a interactive play area, lazy river, slides, raft rides and more. During the summer Wet n’ Wild is hosting a series of ‘dive in’ movies July 11 through August 1. General admission is $37, guests 3-11 are $27. Season passes are available, pay to park. San Bernardino regional parks have a park entrance fee of $8 a vehicle, $10 on weekends and holidays. Annual passes are available for parking. Check out the regional park swimming schedule for San Bernardino, visit the water park areas or stay all weekend and camp, fish, and enjoy nature at the regional parks. Other rates apply for camping and activities, be sure to reserve your campground. Cucamonga- Guasti Regional Park has pedal boat rentals, or a swim lagoon, water slides and zero-depth water play area. Boat rentals are $10 a half hour, swim entrance is $5 for four years and up, all day swim and waterslides are $10 (waterslide rides are for 48” and up). Glen Helen Regional Park has waterslides, zero-depth depth play area and lake swimming area. Swim entrance for ages three and up is is $6 during the week, $8 on weekends and $10 on holidays. Yucaipa Regional Park has pedal boat rentals for $10 a half hour, lake swimming with a sandy beach and a pair of water slides. Swim admission is $5 a person, water slides are $2 for a single ride or $10 for a swimming and waterslide day pass. Lake Gregory has a zero-depth play area, swimming, slides, several boat rental options and an inflatable play area on the water. You can go down the slides for $2 for a single ride, or $7 for a pass. The inflatable play area Splash Island is $7. Annual passes are available for $95 individual, $230 for a family of four. Riverside County hosts two big waterparks that are controlled by the county of Riverside and full of fun for the entire family. Check websites for deals, dates and time, as well as safety and dress code information. Have additional parks you would like us to add to the list? Comment below and let us know!